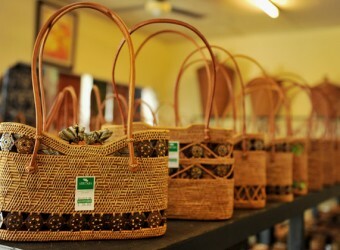 Ashitaba specializes in basketry and handicraft, the shop selling handbags, basketries, containers and more, most products made from ata grass for good quality and in various designs and color. The original products of Ashitaba have best quality and all at reasonable prices that cannot be found in another place. When I come to Bali I go to Ashitaba. All my favorite souvenirs, the simple one is good. I bought Ata bag because it is suitable with my clothes. I bought glass coasters for my friend.